So happy to have Paula of Vintage Kitchen Notes as my second guest in the monthly Baking with Heritage series. I hadn't the slightest clue about Argentinian baking, even though one of my best friends growing up was half Argentinian, the other half, Brazilian. I thought Asado and empanadas pretty much sum up Argentinian food. My son swears by the empanadas in Buenos Aires to be the best in the world. He was there on a soccer tournament in his freshman year in high school and got a hefty dose. Trust me I tried to replicate. Moving fast forward to Paula, who is the gentlest, sweetest person and a super talented baker. Her writing below is romantic. I can imagine sepia toned old world charms through her words. I salivate over her Caramelized Monkey Bread and Soft Pretzels. For those of you who are fluent in Spanish, I am embarrassed to say I am not, Paula also has a food blog in Spanish called Jengibre Azul, Blue Ginger. In our brief brainstorming session Paula threw some ideas around. The little I knew that there are many classic Argentinian breads baked with lard, but for the purposes of this blog, I couldn't. I shot Paula a quick email explaining the entire kosher thing on one foot, though I should put a disclaimer attached here, I am by no mean kosher in the traditional way. 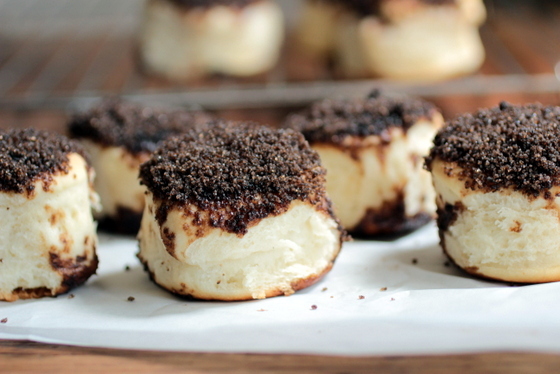 When Paula mentioned these Tortitas Negras cakes, I think we both knew instantly that this is it. 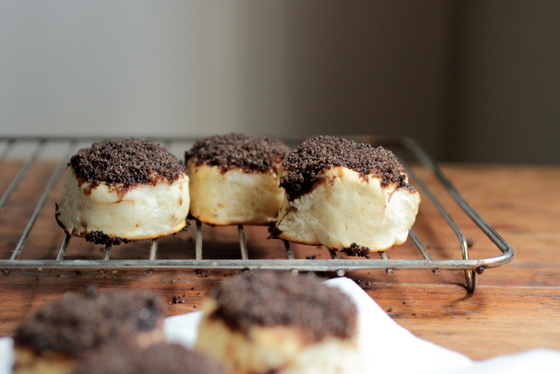 Aren't these Little Black Cakes deliciously intriguing? I was hooked! Hop below to Paula, but before you do so, I encourage you to follow her on twitter and like Vintage Kitchen Notes on Facebook. I can't help myself but share with you her native country's Marinated Steak and Chimichurri Sliders and Empanadas. For those of you who keep kosher, the lard and butter can easily be substituted with oil and margarine. If you wish to be a part of these series, drop me a note. When I read that Shulie was interested in heritage baking I thought I heard her call my name. Baking is my favorite thing to do in the kitchen, and having a chance to make at home something that reminds me of my childhood, of the times when old fashioned bakeries where still modern, is definitely on top of my list. As in sharing a prized recipe with someone as talented as her, and that includes not only her food, but also her tales of the world and amazing photography. I hope you, her readers, enjoy these simple and very traditional little breads. 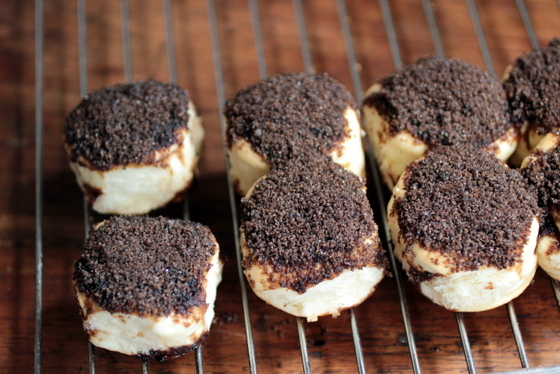 We settled for these `tortitas negras´, small rounds of white dough topped with a crunchy layer of dark brown sugar. They translate into `little black cakes´ and have been around bakeries for ever here in Argentina, where I live. Traditions are a big part of any culture, and one of ours is tea time. We are big on tea time here. As a country where immigrants played a decisive part in what we are today, there are many borrowed ways of doing things. Italian food is a huge deal and having an afternoon break of a beverage and some bakery staple too, anything from bread and butter to danish, croissants or lard crackers. The ritual of drinking `mate´, a bitter infusion that is drank traditionally in a small hollowed out squash with a metal straw, is a rooted tradition and there are many small breads and crackers to accompany that. Though today it has a lot to do with coffee and tea also, the collective taste still likes those flavors that remind us of our ancestors, growing up or simply going into a bakery any given weekend to buy a dozen danish, churros or sweet breads to share with family and friends. Nowadays life is more hectic and fast, many other cultures creep into our daily life, but some things are still favorites, and tortitas negras are one of them. One of the stories is that they were invented as a way to use leftover bread dough, which makes total sense. It is such a simple straight dough, topped with a mix of dark brown sugar and minimal flour to prevent it from hardening too much. Very soft and easy to eat, they make great company to a cup of whatever you like to drink. They are still made in a very simple way. There are no tortitas negras with fancy doughs or modern flavors. The only variation is that now many bakeries sell little white cakes, the top layer being white sugar and flour. I still like the old one. I hope you do too. In a small bowl mix ½ cup warm water and yeast. Let stand 5 minutes, until foamy. In a large bowl mix flour, sugar and salt. Make a well in the center and add remaining water, yeast mixture, soft butter and lemon or vanilla if using. With your fingers start mixing the ingredients, slowly drawing the flour into the liquid. When you have a shaggy dough, turn it onto a lightly floured work surface. Knead for about 3 minutes, until the dough is smooth and even. You can add more flour by tablespoons if it´s too stiff. With a rolling pin, roll the dough, fold it in half and roll again. Do it 4 or 5 times, you don´t have to roll it thin. This will aid in making a more compact dough with a slightly layered texture. The final dough is white, very soft and elastic. Cover the dough with a clean towel and let rest 15 to 20 minutes. Preheat oven to 400ºF /200ºC. Grease a square or rectangular mold with 3-inch rim. Roll the dough again, about 1 ½ inches thick. 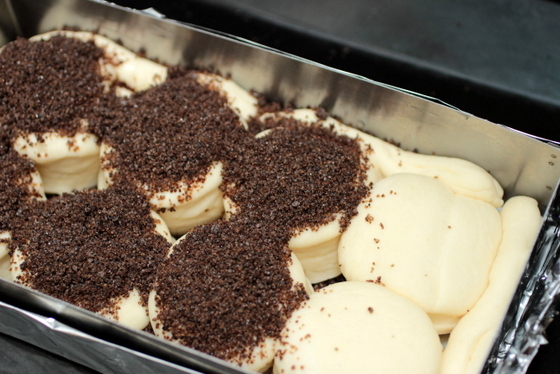 With a round cookie cutter, cut circles and place them on the prepared mold, touching each other. Cover with a clean towel and let rest until puffed. In a small bowl mix sugar and flour. Brush top of dough rounds with water (I do this carefully with my fingers), and sprinkle very generously with the brown sugar mixture, covering as much as you can. Some will fall to the sides, it´s fine. Bake for 15 to 20 minutes, until the sugar is set. Don´t let them get too golden as they will be too dry. Let cool on wire rack for 5 minutes and unmold. They can be eaten warm or at room temperature. Keep them covered. They are at their best the same day they are baked. Makes about 15 little breads. Note: If you want breads with no crusts, before you roll the dough and cut the rounds, take a small piece of dough and roll a thin rope to put around the diameter of the mold. This will act as a cushion and all your tortitas negras will be crustless. What lovely buns! They look really addictive. Shulie, I love to be guest posting here! What a treat for me. Hope your readers and you enjoy it as well! TY Paula. Great to have you here. These rolls are sensational. what a unique recipe - I LOVE THEM! Those look wonderful! I was sure it was poppy or nigella seeds when I first saw the photo. I love how dark the brown sugar is. Bookmarked! I can see that but never crossed my mind, maybe because I knew what expect, maybe?! :) & TY, let us know when you bake these beauties. Wow! 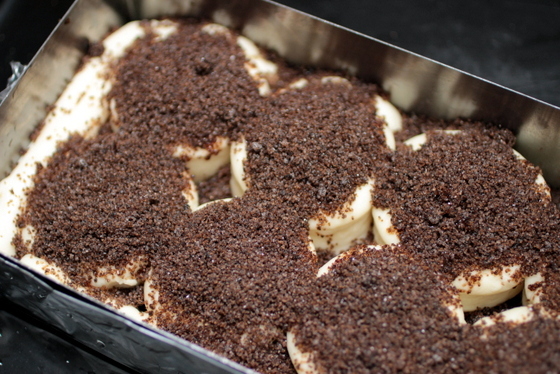 I was sure that the topping was nigella or poppy seeds when I first saw the photo. I love how dark the brown sugar gets! Bookmarked. Paula, these are really intriguing and they look delicious! I love that deep dark brown sugar, bet it tastes rich and full of flavor! This is really spectacular. Such a unique and cool recipe. I'm so impressed. What a wonderful guest post, Paula. If not for you, I might not have ever discovered these soft, sweet gems. I love that the brown sugar/flour topping remains crunchy, almost like a streusel minus the butter, giving these buns texture. At first, I thought it might be poppy seeds too! These are definitely on my 'to try' baking list! What beguiling treats for afternoon coffee or tea! I adore learning about traditional recipes and the stories of their origin. A delightful post! Shulie, so fun to find our sweet friend, Paula, here today! This is a sweet I haven't heard of before, but who wouldn't go for a puff of soft bread with a brown sugar topping? Sounds like a delightful treat! 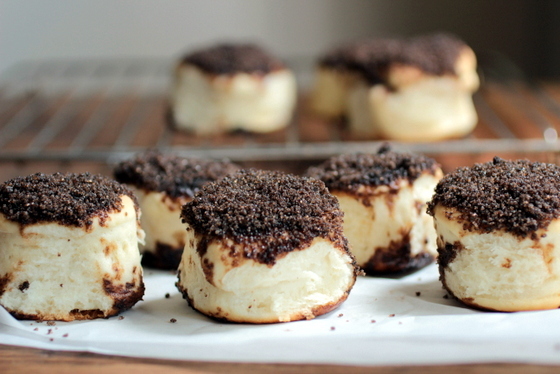 These little black cakes look amazing! I LOVE Paula's blog! What cute little buns, I love the brown sugar topping! These would be perfect with afternoon tea. These are such unique and interesting buns!! I've never heard of these...and they look like such a special treat. Thank you for sharing with me tonight. I just ate a delicious dinner and I'm already hungry again :-) I hope you are having a great start to your week!